Rolling out of 2-race stint that brought the IZOD IndyCar Series competition through Canada, the open wheel series returns to the United States to run on the 2.4 mile Mid-Ohio Sports Car Course located on the outskirts of Lexington. This race is also a homecoming of sorts back to permanent road courses since last month's Watkins Glen event. 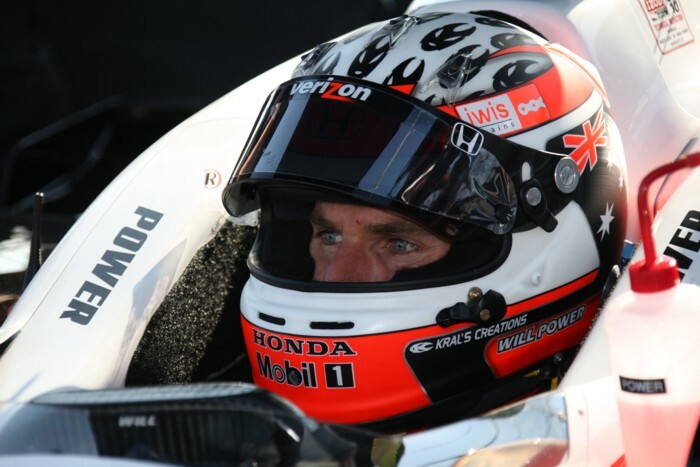 Winning two of the last three races, Will Power is on the verge of securing the series' first road course championship called the Mario Andretti Trophy. Clinching the pole for the Honda Indy 200 at Mid-Ohio with a 1 minute, 7.1997 second lap time through the Firestone Fast Six qualifying session, the #12 Penske driven by the fast Australian needs little more than to finish the event to lock up the honours of road racing champion. Depending on the strong finish, only this race and Infineon Raceway rounds remain for the Mario Andretti Trophy in 2010's IZOD IndyCar tour. Also leading the overall IZOD IndyCar points championship, Will Power first full season with Penske Racing is swimming in success entering a track which Power was unable to compete at in 2009. Planning to insure the 2010 IZOD IndyCar Series overall points remains interesting, reigning champion Dario Franchitti has qualified his #10 Target/ Chip Ganassi Racing car 2nd at a little more than 1/10th of a second slower than the lead Penske Racing vehicle of Will Power. Not using the softer Firestone red tires, Franchitti still remarked that his Dallara-Honda was pulling "..consistent laps..". Offering the biggest surprise in the Mid-Ohio qualifying session was the speed from the KV Racing Technology car of Takuma Sato. Still looking for a finish to reflect some moments of greatness in his rookie year of American open wheel racing, Sato voiced his pleasure in post-qualifying. "I'm very pleased with the result today. I was able to improve each session. We tested here last week which helped me and my engineers a lot. We spent both practice sessions working on improving the car and each change we made led to more positive results". Takuma Sato will be the highest starting rookie at Mid-Ohio as Simona de Silvestro is the next closest driver starting 10th. Ryan Hunter-Reay, 2009 Mid Ohio race winner Scott Dixon and Helio Castroneves rounded out the Firestone Fast Six grouping, timed into the race within that order. Of course, following the Edmonton race where Castroneves' penalty and excessively-passionate behavior became the headline news today in the IZOD IndyCar Series. With the IZOD IndyCar Series delivering a strong showing of 27 entrants for this weekend's Honda Indy 200 at Mid-Ohio, there are some new faces appearing since the last IZOD IndyCar Series round. Including drivers Jay Howard, Graham Rahal and Adam Carroll, last year's Firestone Indy Lights champion J.R. Hildebrand will finally have an opportunity in 2010 to run in the big series. Having driven in the American Le Mans for Patron Highcroft Racing, testing with Force India along with driving a vintage F1 car at Montreal, Hildebrand will drive the #24 Dreyer and Reinbold Racing car for this race. A notable absence to the driver lineup at Mid-Ohio is Brazilian's Mario Romancini in the Conquest Racing car. Due to lack of funds, Romancini lost his ride which has regrettably robbed the 2010 IZOD IndyCar Series fan of a steady Rookie of the Year title contender. Through much of the season, the Brazilian was the counter-measure to Swiss' Simona de Silvestro. Conquest Racing will be fielding a second car for Turin, Italy's Francesco Dracone. Guaranteed to be a perfectly hot summer day, the Honda Indy 200 at the Mid-Ohio Sports Car Course will start Sunday with television coverage starting on Versus at 2:30 P.M. Eastern time for American viewers and on TSN2 for Canadian audiences.